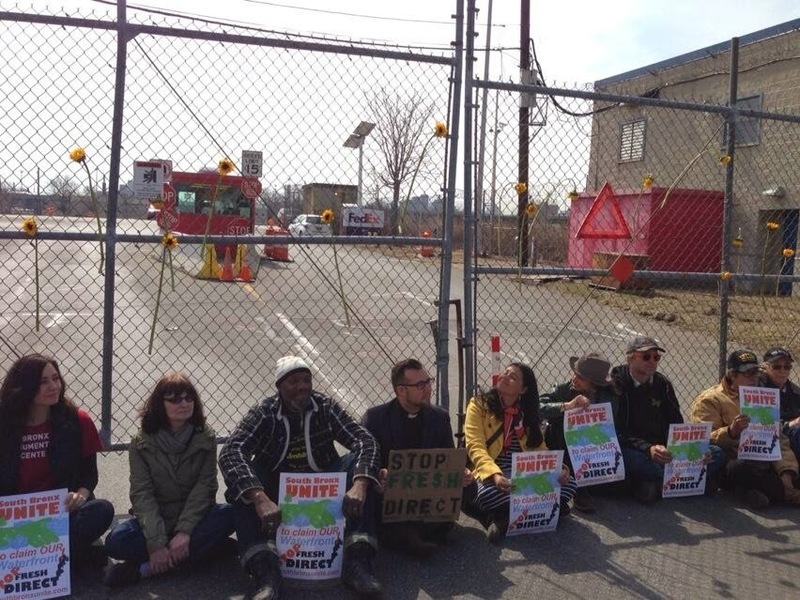 On March 22, 2014, activists sit in front of a gate to the Harlem River Yard, proposed site for a new FreshDirect facility that would bring 1,000 more diesel trucks per day to over-saturated streets in the Mott Haven neighborhood of the South Bronx. 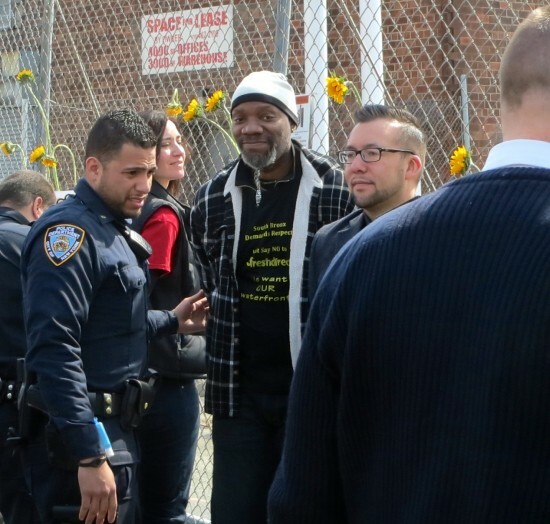 FreshDirect, the online grocery delivery company whose products many in the South Bronx cannot afford, is seeking to build a new facility in the Harlem River Yards. Operation of the facility would involve more than 1,000 truck trips each day on already diesel-saturated streets. The facility is planned for a neighborhood called “Asthma Alley.” One in four children in the South Bronx suffer from asthma, up from one in five a few years ago. For three years, the community has stood against the bogus claims of the company, which is dangling the offer of (non-living-wage) jobs. South Bronx Unite and a coalition of organizations, with support from BCJN and a growing number of climate and environmental justice organizations around New York City, are standing up for the health of the people of the South Bronx, and the community’s right to determine its own future. Join with Bronx Climate Justice North in supporting the courageous efforts of South Bronx Unite to defeat the FreshDirect move. Please read Bronx United Against FreshDirect, a BCJN Point of View piece published by The Riverdale Press on November 27, 2014. 1) Boycott: Please boycott FreshDirect, and urge friends and neighbors to do so. 2) Sign the Petition: Please sign the Change.org petition informing Mayor de Blasio and FreshDirect that you are boycotting the company; share the petition to your networks. 3) Stay Updated: Please subscribe to, read, and share SBU’s newsletters about FreshDirect. You can find the latest one, HERE. It contains important requests for action. Subscribe HERE. Daily Kos, by BCJN member Marcia Yerman, The South Bronx fights air pollution in “Asthma Alley,” 4/8/15. 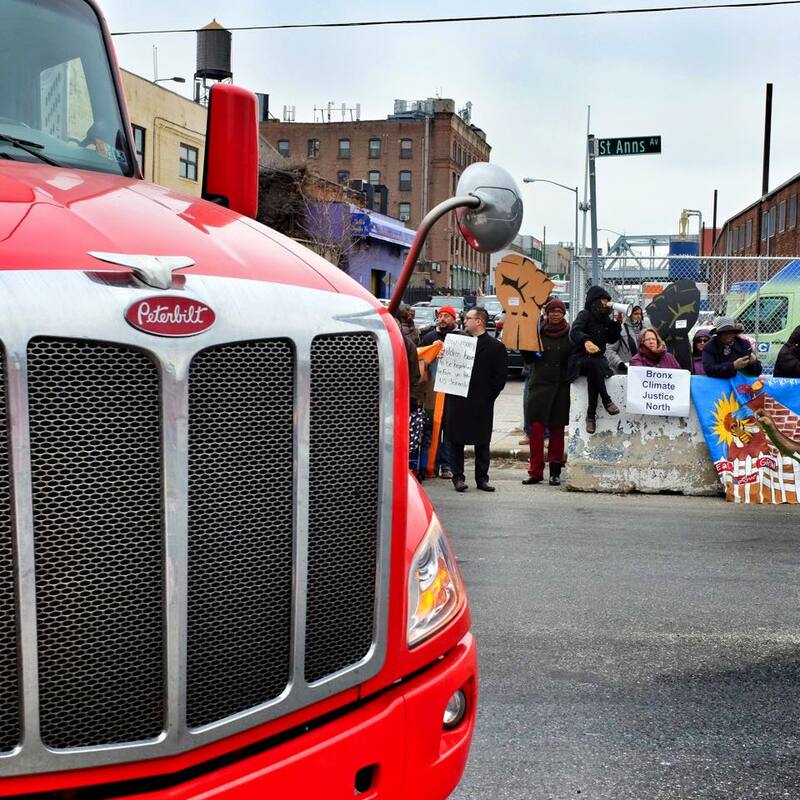 Activists protest a secret, early-morning ground-breaking ceremony for the FreshDirect facility in the Harlem River Yards in the South Bronx, on December 22, 2014, just three days before Christmas. Even in the frigid air, the diesel fumes from continually passing trucks made breathing difficult. 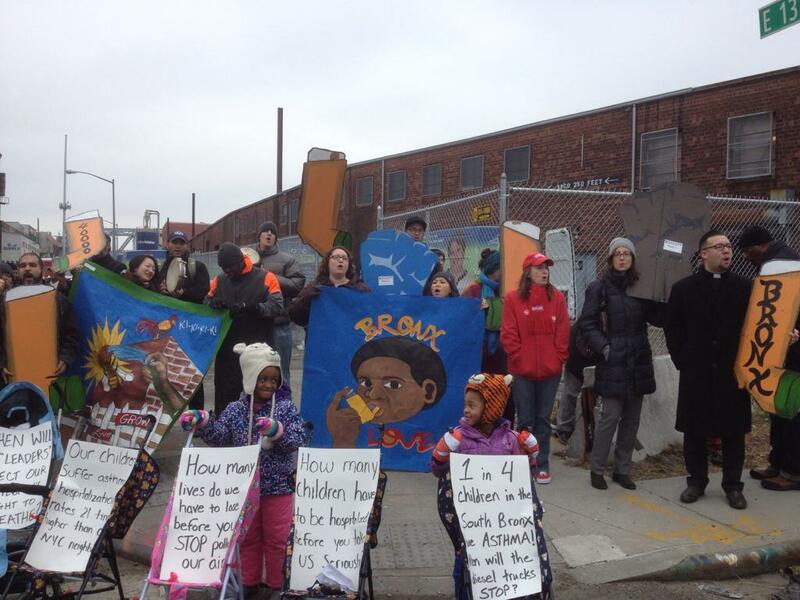 Protest of secret ground-breaking ceremony for FreshDirect, Harlem River Yards, South Bronx, December 22, 2014.